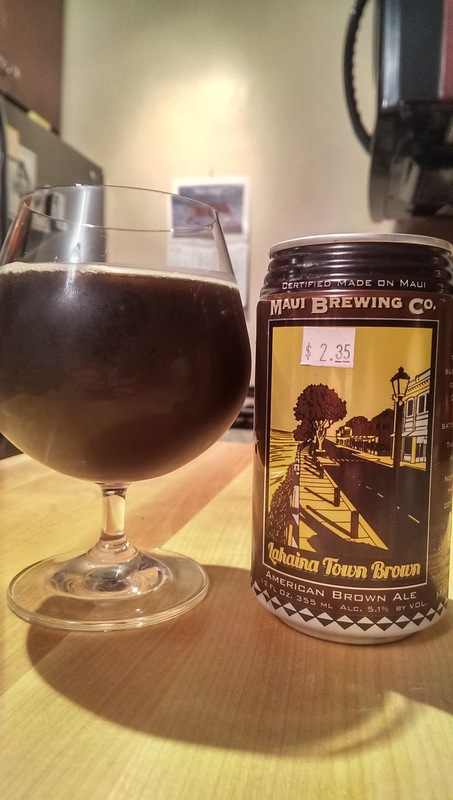 Mostly everything we get from Maui is brewed with something else: fruit, coconut, whatever. So, I was somewhat bummed to see this had no specialty addition. Just a plain old brown ale? Really? I'll give it a shot because I have a lot of respect for Maui B.C. -- they make some excellent beer, and even made me reconsider my stance against porters. Crisp malty flavors, but not overly "brown", meaning you get a nice level of bitterness, and some chocolate and nutty flavors. Nothing outstanding, but pleasant. As you'd perhaps expect with any brown ale, though, there's a lingering coating in your mouth that's not terribly endearing. I don't think it's a flaw more than it is me hating on brown ales. To me this tastes more like a very light chocolate stout, but it's pleasant enough that I could see enjoying it in paradise, even though I know nothing about the town of Lahaina.